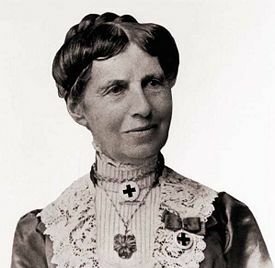 Clarissa Harlowe Barton (better known as Clara Barton) (December 25, 1821 – April 12, 1912) was the founder of the American Red Cross. As an accomplished educator and hard-working professional woman, she was able to earn a salary equal to a man's. However, when the American Civil War broke out, she sacrificed her personal life for the hardships of the battlefield, where she served the sick and wounded. In establishing the American Red Cross, Barton expanded its mission beyond wartime to include disaster relief—a humanitarian task that has been central to the Red Cross's work ever since. As a patriot, he had me serve my country with all I had, even with my life if need be; as the daughter of an accepted Mason, he had me seek and comfort the afflicted everywhere, and as a Christian he charged me to honor God and love mankind. Barton remained true to her father's advice, and the legacy of her service to humanity carries on in the record of the American Red Cross, which she founded. Barton, the fifth and youngest child of Sarah Stone and Stephen Barton, was born on Christmas Day, 1821, in Oxford, Massachusetts, a small farming community. Her father was prominent in the local Universalist church and a former British Loyalist in the Revolutionary War. Her father's stories about his war experience in the army of General "Mad" Anthony Wayne led to her later interest in military matters. Her father was a farmer and horse breeder while her mother managed the household. She and her parents attended the Universalist Church in Oxford. As a child, she was shy and retiring. All her brothers and sisters were at least ten years older. Young Clara was home-educated and extremely bright. She spent brief periods in public school settings but most of her education came from her two brothers and two sisters. By the time she was four years old, Clara could easily spell complicated words. When Clara was six, her older sister Dolly, had a mental breakdown. Dolly apparently broke down under the stress of taking care of their emotionally unbalanced mother. Thereafter, sister Sally looked out for Clara while Dolly remained locked in an upstairs room. Clara learned early to make the best of a difficult family situation, Later, at the age of 11, a fall at a construction site rendered her brother David an invalid. Clara stayed by his side for two years and learned to administer all his medicine, including the "great, loathsome crawling leeches." Clara was 15 when L. N. Fowler, a noted phrenologist, advised Barton's parents to have her teach school. In 1839, she passed an examination and began a ten-year teaching career in district schools near Oxford, Massachusetts. When the school where she taught won a prize for discipline many job offers followed, even after she demanded and received the same pay as male teachers. In 1854, suffering from overwork, she took a break from teaching and attended the Clinton Liberal Institute in Clinton, New York, where she studied analytic geometry, calculus, astronomy, mathematics, and natural science, in addition to French, German, ancient history, philosophy, and religion. When the term ended, schoolmates Charles and Mary Norton invited her for an extended visit with their family in Hightstown, New Jersey. Soon she was teaching in the Cedarville school and later in Bordentown. It was in New Jersey that she started the state's first free public school. The school was so successful that a new building was constructed and additional teachers hired. When a man was brought in to head the school at a salary that was $250 more than hers, she resigned. In 1854, she moved to Washington, D.C., where she became the first woman clerk in the Patent Office, for a salary equal to the men's. The status of female government workers became uncertain soon afterwards when Secretary of the Interior Robert McClelland took over the patent office under the Buchanan Administration. Barton's position as a clerk was reduced to copyist and eventually eliminated. In 1857, Barton returned to Massachusetts and lived with relatives and friends until she was rehired in 1860, to her position as a copyist with the election of President Abraham Lincoln. When the American Civil War began, Barton resigned her position in the Patent Office to devote herself to the care of wounded soldiers on the field of battle. With the outbreak of war and the cascade of wounded Union soldiers into Washington, she quickly recognized the unpreparedness of the Army Medical Department. In April 1861, after the First Battle of Bull Run, she established an agency to obtain and distribute supplies to wounded soldiers. For nearly a year, she lobbied the U.S. Army bureaucracy in vain to bring her own medical supplies to the battlefields. Finally, in July 1862, she obtained permission to travel behind the lines, eventually reaching some of the grimmest battlefields of the war. The Battle of Cedar Mountain on August 9, 1862, in Culpepper, Virginia, was the first documented battle at which Barton served on the field. Arriving on August 13, she spent two days and nights tending the wounded, many of whom had limbs amputated, sometimes without chloroform. Before leaving, she also provided assistance at a field hospital for Confederate prisoners. In April of 1863, Barton reported to Hilton Head, South Carolina, in preparation for the anticipated bombardment of Charleston. She served there with her brother, Captain David Barton, an Army Quartermaster and 15-year-old nephew, Steven E. Barton, serving in the military telegraph office there. In 1864 she was appointed by Army of James General Benjamin Butler "lady in charge" of diet and nursing at an X Corps Hospital near Point of Rocks, Virginia. In 1865, Pres. Abraham Lincoln placed her in charge of the search for the missing men of the Union army, and while engaged in this work she traced the fate of more than 20,000 men. As the war ended, she was sent to Andersonville, Georgia, to identify and mark the graves of some 13,000 Union soldiers buried there, the site of the horrific prison run by the Confederate Army. This experience launched her on a nationwide campaign to identify soldiers missing during the Civil War. She published lists of names in newspapers and exchanged letters with veterans and soldiers' families. She also delivered lectures on her war experiences, which were well received. She met Susan B. Anthony and began a long association with the suffrage movement. She also became acquainted with Frederick Douglass and became an activist for black civil rights. She also shared the stage on various occasions with Ralph Waldo Emerson, William Lloyd Garrison, and Mark Twain. The search for missing soldiers and years of toil during the Civil War physically debilitated Barton. In 1869, her doctors recommended a restful trip to Europe. While in Switzerland she met Dr. Louis Appia, and, for the first time, heard about the International Red Cross. The United States had not been a party to the Geneva Convention of 1864, which made the International Red Cross possible, so Barton didn't learn of its existence until traveling in Europe. In September 1870, shortly after the Franco-Prussian War was declared, she met the Grand Duchess of Baden, Germany, Louise, daughter of Kaiser Wilhelm and established a life-long friendship. Under the sponsorship of the Grand Duchess and the International Red Cross, Barton went to the battlefield and the besieged city of Strasbourg, France. There she met Antoinette Margot, who became her co-worker, traveling companion, and translator. In Strasbourg, they organized relief and established sewing factories in order to provide clothing for the residents and employment for women. In 1873, suffering from nervous exhaustion, she returned to the United States and in 1876 she moved to Dansville, New York, first to a sanitarium and later to her own home. Relaxation, a healthful diet, and congenial company allow her to regain her health. When she returned to the United States, she inaugurated a movement to secure recognition of the International Red Cross society by the United States government. She wrote and distributed a pamphlet, The Red Cross of the Geneva Convention: What It Is. On May 21, 1881, the American Association of the Red Cross was formed and Barton was elected President at a meeting held June 9, in Washington, D.C. By August the first local Society of the American Association of the Red Cross was established in Dansville, New York. Over the next few months, additional chapters were formed in other towns and cities. The United States ultimately signed the Geneva Agreement in 1882. When she began this organizing work in 1873, no one thought the U.S. would ever face another experience like the Civil War, but her success was based on her vision that the American Red Cross could also be available to respond to other types of crisis. As Barton expanded the original concept of the Red Cross to include assisting in any great national disaster, this service brought the United States the "Good Samaritan of Nations" label. John D. Rockefeller gave money to create a national headquarters in Washington, DC, located one block from the White House. 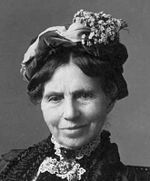 Clara Barton continued to do relief work on the battlefield as an aid until well into her seventies. She went to Cuba with a cargo of supplies after the Spanish American War was declared in 1898, and spent six weeks on the scene of the Galveston, Texas floods, at age 79. She resigned from the American Red Cross in 1904 at the age of 83 and spent her remaining years in Glen Echo, Maryland. She died in 1912 at age 90, and is buried less than a mile from her birthplace in a family plot in Oxford, Massachusetts. The American Red Cross she founded is one of the largest humanitarian organizations in the world. Barton was the most decorated American woman, receiving the Iron Cross, the Cross of Imperial Russia, and the International Red Cross Medal. Her final act was founding the National First Aid Society in 1904, which later became a part of the American Red Cross. Her celebrity status brought with it much correspondence, some from children asking about her childhood. In response she wrote The Story of My Childhood, published in 1907. In 1942, a United States Liberty Ship named the SS Clara Barton was launched. Clara Barton's Birthplace in North Oxford, Massachusetts is operated as a house museum as part of the Barton Center for Diabetes Education, a humanitarian project established in her honor to educate and support children with diabetes and their families. The home in Glen Echo were Clara Barton lived for 15 years. In 1975, Clara Barton National Historic Site was established as a unit of the National Park Service at her Glen Echo, Maryland home. The first National Historic Site dedicated to the accomplishments of a woman, it preserves the early history of the American Red Cross and the last home of its founder. 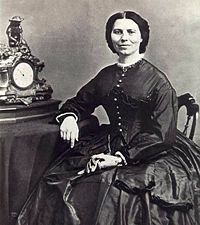 Clara Barton spent the last 15 years of her life in her Glen Echo home, and it served as an early headquarters of the American Red Cross as well. "I have an almost complete disregard of precedent, and a faith in the possibility of something better. It irritates me to be told how things have always been done. I defy the tyranny of precedent. I go for anything new that might improve the past." " The door that nobody else will go in at, seems always to swing open widely for me." "I may be compelled to face danger, but never fear it, and while our soldiers can stand and fight, I can stand and feed and nurse them." "An institution or reform movement that is not selfish, must originate in the recognition of some evil that is adding to the sum of human suffering, or diminishing the sum of happiness." "The surest test of discipline is its absence." ↑ Clara Barton Birthplace Museum Retrieved December 19, 2012. ↑ Clara Barton Center for Diabetes Education Retrieved December 19, 2012. ↑ Clara Barton National Historic Site Retrieved December 19, 2012. Joyce, James Avery. Red Cross International and the Strategy of Peace. New York: Oceana Publications, Inc., 1959. Ross, Ishbel. Angel of the Battlefield: The Life of Clara Barton. New York: Harper and Brothers Publishers, 1956. The Barton Center For Diabetes Education, Inc.. This page was last modified on 23 February 2017, at 17:33.